The idea of smart home technology may be unfamiliar to some homeowners. Home technology puts control of basic home systems at your fingertips, either through an app or a centralized unit within the home. There are many benefits to using smart home technology: managing home security, adjusting home lighting, and more. One significant benefit is reduced energy consumption. Smart home technology isn’t as costly or confusing as it may seem. Here are some benefits of using smart home technology and some tools you may consider for your home. Smart home technology can reduce home energy consumption and save on monthly energy bills. Smart home technology can turn off power to appliances and home systems when they are not in use (such as during the work or school day when a home is empty). By delivering power to key systems and appliances only when necessary, energy bills decrease. This savings can be noticed as soon as your first energy bill. Apps like LG’s SmartThinQ take saving energy a step further. This app and other similar apps connect to smart grids to identify the times where demand for energy is low. It then notifies homeowners of better times to use energy for routine household chores such a laundry or charging an electric car. Have you left your house and wondered if you’ve adjusted the temperature? Smart thermostats help you to know what’s happening in your home at any time. Some smart thermostats like Nest can automate home heating and cooling through an intuitive learning system that learns your home’s occupancy and energy patterns to maximize comfort when you are home and energy savings when you are not. 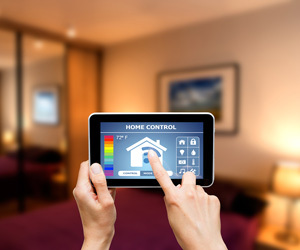 Home automation can make your home more comfortable. Through the touch of a button you can turn on interior lights, adjust your heating system, and more to ensure your home is at your desired comfort level the moment you walk in the door. Adding smart home technology can have many benefits! Check out the links above to learn more about many of these options.